Crisp mountain air, stunning mountain scenery and uncomfortable boots; I am standing on top of the world, about to point my skies straight down and send my 59-year-old bones hurtling down a mountain. “Welcome back, Donna”, I heard Lake Louise say, somewhat sarcastically. It’s been eight years since I’ve last been down hill skiing, and I was wondering if maybe I’m too old for this sport. I’m among the oldest on the mountain, and except for Ray the oldest in my group. It’s Christine Blowers fault that we’ve driven all the way through the Canadian Rocky Mountains in January, dodging snowstorms and avalanche blasting all the way. 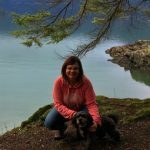 Months ago she found a great package deal through SkiBig3 that included accommodations, lift tickets and ski rentals. 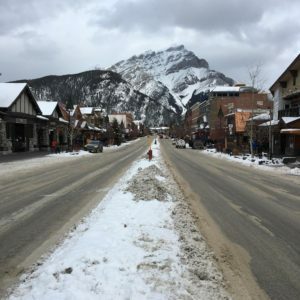 The town of Banff, it seems, is the quintessential ski town, and I’m not really sure why. The great ski hills, Sunshine and Lake Louise are well out of town, so it’s not that. It’s colder here in January than what you might find south of the border or in Whistler. 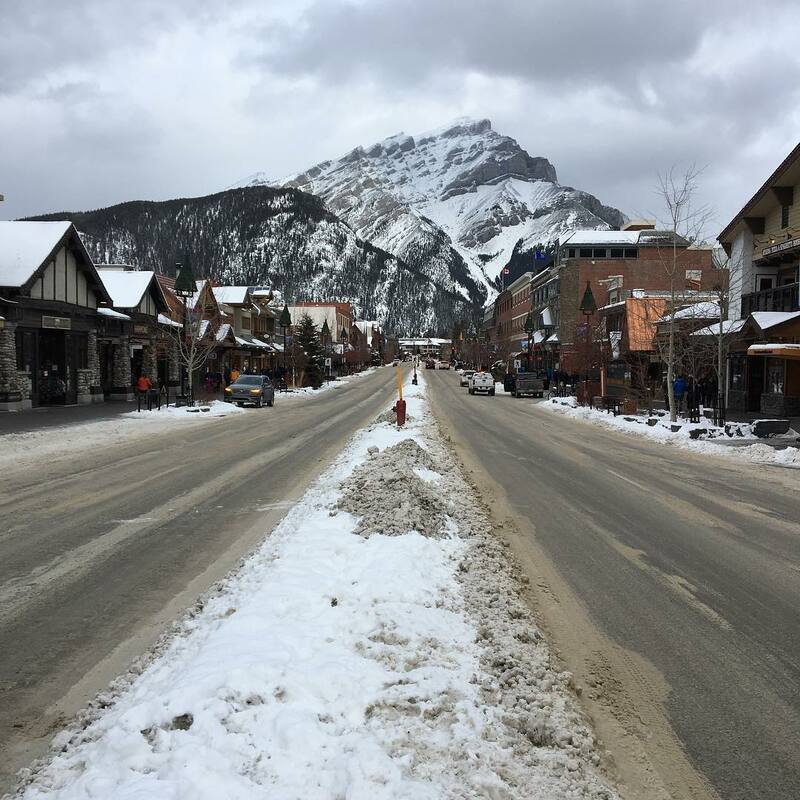 A walk down the main strip, though – a strip whose focal point are the majestic Rocky Mountains that surround the town, is full of restaurants, bars, gear stores and souvenirs shops. In the winter the town is young and international. It seems only Australians, or possibly English work here. There’s a vibe. 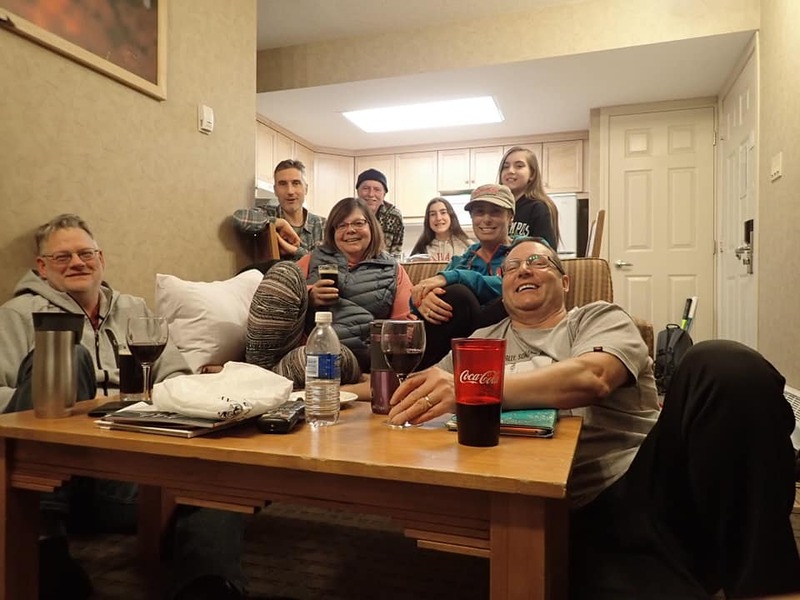 Our group stayed a bit out of town, but we wandered in a few times for hiking, hot springs, dinner, drinks and to have our skies fitted. Every morning our bus traversed the town, picking up skiers and snowboarders heading to the slopes for the day. We’re here to ski, and Banff rates among the top ski destinations in the world! There are several free buses every day that head out to Lake Louise, Sunshine or Norquay ski resorts. 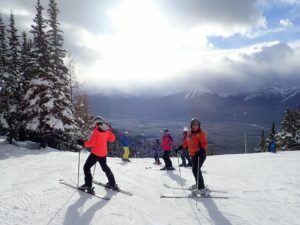 We skied four days, two days at each of Sunshine and Lake Louise. We didn’t make it to Norquay. We’ve arrived just after a big snowstorm; snow conditions are fantastic. We started our week at Lake Louise. There seems like a lot of to-do to get to this place; a long, somewhat dangerous drive, equipment rental, bus ride, chair lift – but finally here I am, standing at the top of the mountain, looking down and hoping I remember what to do. And then I pushed off, and remembered why it’s worth all the effort. You can recognize me skiing from a long way off. I’m the one swishing and swooshing down pretty much any slope, very, very slowly. I’m not likely to hurt myself out here, but I am having a wonderful time. The next day the weather turned cold and we went to Sunshine Ski Hill. Sunshine is higher than Lake Louise, and many of the runs are above the tree line. 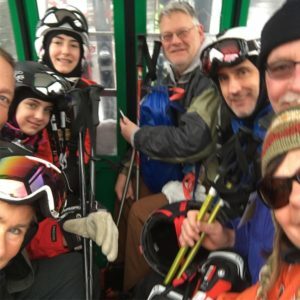 It was super cold on the chair lifts, and we found ourselves spending more time seeking out covered gondolas and covered lifts. The skiing was warm enough, but by afternoon the wind and cloud cover combined to make the mountain disappear. We could no longer see the snow we were skiing on and called it a day. Do NOT drink the wine at the base of the mountain here. We ordered 2 glasses of mediocre wine and paid $28 plus tip for it. The real magic of a ski trip are the friends you go with. We had a great group: Chris, Danny, Kim, Adrian, Deanna and Emma joined us. We cooked dinner most evenings and shared a keg of Hoyne’s craft beer we brought from Victoria. Apres-ski always included a soak in our outdoor hot tub, and board games rounded out the evening. Good friends, good skiing and great times, yet another great ski week. 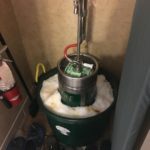 Turns out it’s worth all the effort after all.